The restaurant recently hired a new executive chef, John Helleberg, who will continue to build a menu with bounty from local farms like Kiyokawa Family Orchards, Wildwood Farm and Saur Farming. It’s a lazy weekday afternoon in Hood River, long past lunch and hours before dinner, but Solstice Woodfire Café & Bar is hopping. Young families cluster around the kids’ play area on one side of the room, and a group of young kiteboarders fresh off the water fills the patio. Out the window, the Columbia River peaks with white caps as it rolls past the Hood River Waterfront Park. 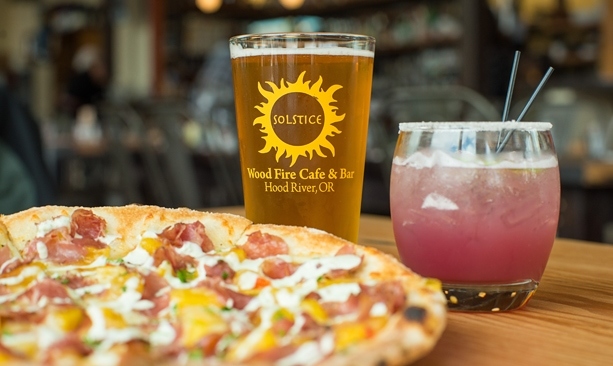 Locals and visitors alike are drawn here for the culinary delights of Solstice’s wood-fire pizzas and farm-to-table cuisine. 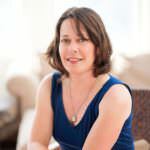 “Ingredients — that’s the core of our story,” says co-owner Suzanne Wright Baumhackl. She and her husband, Aaron Baumhackl, first rolled out their pizza dough in the Gorge in 2007, offering creations like the Country Girl Cherry (chorizo, cherries and goat cheese), which won a best pizza award from Food Network Magazine in 2011, and the BLBB (butternut squash, leeks, bacon and blue cheese) as well as hearty salads like the Siragusa Pear Salad, made with pears from nearby Siragusa Orchard. For a mom-and-pop operation in a small town, Solstice has gained a robust following. With accolades from the likes of “Every Day with Rachel Ray,” “The New York Times” and Trip Advisor, it’s very much on the map for visitors to Hood River. 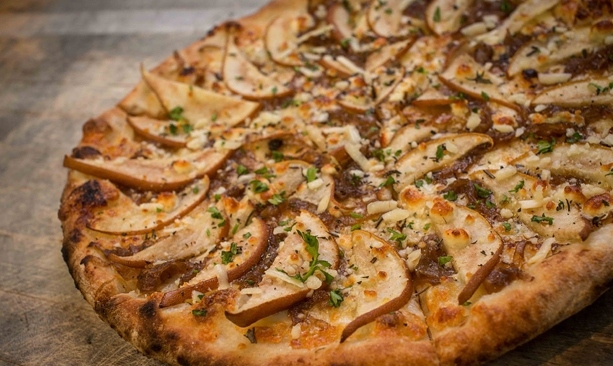 “We have achieved this extraordinary status with people saying if you go to Hood River, you just have to have the Country Girl pizza,” says Wright Baumhackl. That success follows years of hard work. The first Solstice location was across the river in the town of Bingen, Washington. Locals flocked to the location for the farm-sourced menu (despite having to pay a bridge toll and Washington state tax when coming from the Oregon side). The whistle of the train on the adjacent tracks frequently punctuated the dining room, but people kept coming, drawn by the fresh menu, a kid-friendly atmosphere and the warm hospitality of the owners and staff. 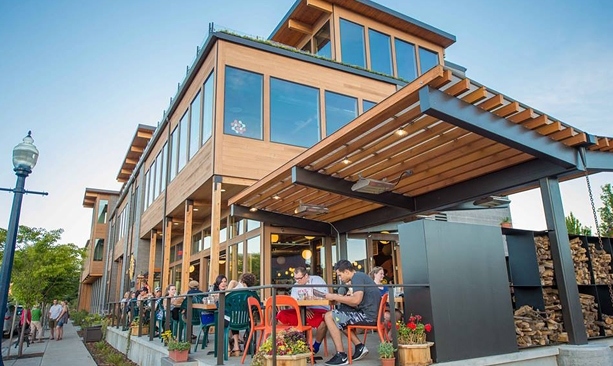 In 2013 when developers approached the couple about being the first restaurant on the Hood River waterfront, the Solstice owners saw more than an opportunity to expand their business; they saw a chance to enhance a core value — the focus on community. “How rare to have the opportunity to create a new neighborhood,” Wright Baumhackl says. To make it happen, they launched a Kickstarter campaign to raise $50,000 to help with the build-out of their new space, and their loyal customers responded enthusiastically. Solstice surpassed their goal well before the end date. “We were blown away,” Wright Baumhackl says. The new space, which opened in December 2013, added a full bar with signature cocktails like the Sweet Suzanne Basil Gimlet, the Farmers Daughter gin cocktail and the Campfire Martini (with toasted marshmallow syrup). It maintained its craft beer taps from around Oregon and a stellar regional wine list. Directly across from a children’s play area, swim beach and climbing wall, the location couldn’t be better. The business is thriving and growing. What has remained the same is the sense of community. “For us, we are thrilled to watch kids grow up and to have people have their celebrations here,” Wright Baumhackl says.